Peter Coles weighs up three books on the momentous expedition that proved the general theory of relativity. Peter Coles is Professor of Theoretical Physics at Maynooth University in Ireland. In 1916, Albert Einstein published his general theory of relativity in full mathematical detail. 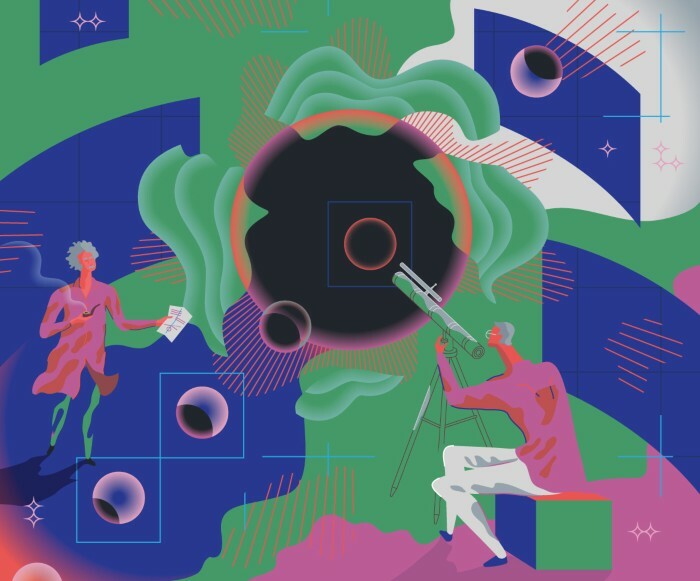 That opened the window on a radically new framework for physics, abolishing established notions of space and time and replacing Newton’s formulation of the laws of gravity. Einstein’s revolution was to change the course of science; but in the years immediately after publication, there was no definitive observational evidence that his theory was correct. Enter Arthur Stanley Eddington. An astronomer interested in Einstein’s theory because of its wide-ranging implications for astrophysics and cosmology, Eddington took on the task of proving it. By harnessing a total solar eclipse, he argued that the deflection, or bending, of light by the Sun’s gravity could be measured. This was a critical test, because Einstein’s theory predicted a deflection precisely twice the value obtained using Isaac Newton’s law of universal gravitation. The needed eclipse came 100 years ago, in 1919. Eddington is now forever associated with two expeditions to view it: from Sobral in northern Brazil, and the island of Príncipe off the coast of West Africa. Those momentous ventures form the kernel of three books commemorating the centenary: No Shadow of a Doubt by physicist Daniel Kennefick, Gravity’s Century by science journalist Ron Cowen, and science historian Matthew Stanley’s Einstein’s War. Einstein’s theory, eight years in the making, sprang from insights he had developed after he published his theory of special relativity in 1905. One of the effects predicted by the new theory was that light rays passing close to a massive body, such as a star, should be bent by its gravitational field. This effect had been predicted qualitatively using Newton’s theory of gravity. Tantalizingly, Newton himself had written in his 1704 opus Opticks: “Do not Bodies act upon Light at a distance, and by their action bend its Rays…?” But there is no evidence that he calculated the magnitude of the effect (the first full calculation was published by German mathematician Johann Georg von Soldner, in 1804). Newton’s theory of gravity did not, of course, formulate gravity as a consequence of curved space. That was Einstein’s innovation. And when he calculated the effect, he confirmed that light is deflected (as in the Newtonian theory), but through curved space. It is this curvature that doubles the deflection. Einstein first publicly aired the general theory of relativity to the Prussian Academy of Sciences in 1915. The First World War was by then well under way, in all its horror. The next year, despite wartime severance of communication channels, Eddington and fellow astronomer Frank Watson Dyson — then director of the Cambridge Observatory and Astronomer Royal, respectively — managed to obtain Einstein’s published papers. Dyson immediately realized that the total solar eclipse in 1919 would prove an ideal test. During this eclipse, the Sun would sit in front of the Hyades, a cluster of bright stars in the constellation of Taurus. Thus, at totality, many stars would be visible near the eclipsed disk. (This was key because the light-bending effect predicted by Einstein is greatest for stars observed close to the Sun.) The stars’ positions relative to the Sun could be recorded and measured on photographic plates, and then compared with reference plates showing the stars when the Sun was nowhere near the field of view. Any apparent shifts, caused by the Sun’s gravitational field, could then be calculated. The more stars measured, the better the chance the observers would have of correcting for systematic errors and reducing random ones. That was the idea. But there were many practical obstacles to surmount, both in the technicalities of making the observations, and in the expeditionary logistics. The eclipse’s path of totality passed from northern Brazil across the Atlantic to West Africa, making it impossible to mount an expedition from Britain until hostilities had ceased. The Armistice in November 1918 left just enough time to put the plan into action. Dyson, in overall charge of the expeditions, remained in England. Eddington travelled to Príncipe; Andrew Crommelin, who worked at the Royal Greenwich Observatory, London, went to Sobral. The details of the dual expeditions are well served by No Shadow of a Doubt. Meticulously researched and vividly written, the account is sure to become the standard reference work on this fascinating example of ‘Big Science’. Eddington, Kennefick reveals, had terrible luck. Met by poor weather in Príncipe, he managed to make fewer measurements than he had hoped. Then, a proposed strike by a steamship company meant that he could not stay in Príncipe long enough to measure the star positions on his plates on site, and had instead to do the analysis after he had returned to England. Crommelin had much better conditions in Brazil. Despite technical issues with equipment that left many plates badly blurred, his measurements were decisive, and were noticeably closer to the Einstein prediction than to the Newtonian. The results were announced collectively in November that year, at a special joint meeting of the Royal Society and Royal Astronomical Society in London. It made front-page news around the globe. That initial conclusion by Dyson, Eddington, Crommelin and their teams was subsequently confirmed by many further eclipse experiments. Yet Eddington has been accused by some of mishandling the eclipse measurements. Kennefick’s title, No Shadow of a Doubt, is thus both a pun and a declaration of intent to dispel these suspicions. Kennefick discusses the criticisms in some detail. I can add a couple of brief points. One is that Eddington had to adopt a Plan B when analysing the Príncipe data, after misfortune had forced his hand; but, in my opinion, he did nothing unreasonable. All the 1919 eclipse measurements are tabulated (in F. W. Dyson et al. Philos. Trans. R. Soc. Lond. A 220, 291–333; 1920). It is straightforward, and also quite instructive, to analyse them using modern statistical techniques. I’ve done this, and found no evidence that Eddington ‘cooked the books’. It’s a huge misfortune that none of the original plates from either expedition survives: otherwise, it might have been possible to measure them using more sophisticated technology. Eddington’s plates were lost after he died in 1944 — his sister might have thrown them away when she was forced to move out of the Cambridge home they had shared. Crommelin’s plates seem to have disappeared in the course of successive reorganizations at the Royal Observatory. Gravity’s Century concentrates more on the broader ramifications of Einstein’s theory in cosmology and astrophysics, including black holes and gravitational waves. At fewer than 200 pages, Cowen’s book is a breezy and enjoyable read, a welcome addition to a crowded shelf of books on these topics. Cowen also goes into Einstein’s incarnation as a cultural icon. The ‘miracle year’ of 1905, when he published papers on Brownian motion and the photoelectric effect as well as on special relativity, made Einstein a star of physics. The eclipse expeditions of 1919 did much more, cementing his reputation among physicists and transforming him into an international superstar. Yet, in my view, at least part of the reason for that sudden celebrity is that the expedition came just after the war’s end. Moreover, it was a British experiment testing the ideas of a German theorist. After four terrible years of death and destruction, perhaps people found in Einstein’s triumph a symbol of some sort of reconciliation. Stanley shares that view in Einstein’s War. Detailed and readable, the book complements No Shadow of a Doubt as an account of the eclipse expeditions and their political backdrop. It is especially revealing about Einstein’s scientific work and private life leading up to the momentous events of 1919 — particularly in showing how these were affected by the First World War. One of the interesting facts from Stanley’s account is that Einstein had made a stab at calculating the bending of light back in 1911, before he had formulated the full general theory of relativity. His result was precisely the same as the Newtonian value. I was left wondering what would have happened to his reputation if measurements had been taken then. Would they have been a setback? Or would they just have driven him harder to produce the full theory, with its crucial factor of two? Correction 17 April 2019: An earlier version of this article gave the wrong subtitle for Einstein’s War. It has now been corrected.